Pose. Feel the holds! Stick your right foot on a dink! ... get your left hand onto right hand starting hold. Stick your right foot on good foothold, flag, then bring right hand into sidepull, which feels quite nice. 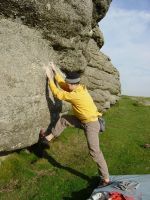 Stretch your left hand out to sloper which feels a bit poor but improves as you get your weight underneath it. Do some footwork then bring your right into the crystally sloper thing. Do some more footwork then up left to a reasonable crimp. ... and lay one on for the a good edge! Match and finish direct ... easier but a little high.